The music on this beautifully sung and played CD is part of CPO's project, 'Musica Sacra Hamburgensis 1600-1800'. As much as anything, this celebrates the post of city church director in Hamburg over those two centuries; it features the music of those composers who held the post - including Telemann. 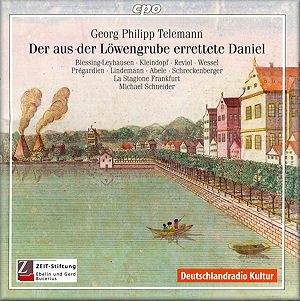 Until recently, the oratorio Der aus der Löwengrube errette Daniel (Daniel delivered from the lion's den) was rarely associated with Telemann. One reason for that was its incorrect ascription to Handel, despite at least two documents which attest unambiguously to its real authorship. It's now clear that the piece was first performed as part of the annual church cycle on 29 September 1730/31, for the feast of St Michael; it was composed to a libretto by Albrecht Jacob Zell (1701-1754). Der aus der Löwengrube errette Daniel has many operatic qualities. This must have been somewhat contentious for Telemann. He was still writing operas; but opera was a genre frowned upon by the city authorities. The devotional aspects of this work, though, mean that it is an oratorio and not an opera - despite the inclusion of many aspects of the latter… attention to character, some dramatic dialogue and choral writing, as well as frequent short commentaries on the action - the chorus's intervention in the recitative, Verräter seht ihr nun [tr.31], for example. Above all, it's the setting of a Biblical theme - and a martial one at that - which confers upon Der aus der Löwengrube errette Daniel its most prominent theological stamp. But there is much human interest: we really care about Daniel's fate. We easily identify with a strong figure determined to face adversity rather than capitulate to a doctrine to which it is impossible to subscribe. Indeed, we can readily respond to the joyous outcome of Daniel's courage and his eventual deliverance. There is a welcome absence of rhetoric in both music and text, though, such that the outcome is not a forgone conclusion. The final chorus, for example (Herr Gott, wir loben Dir [tr.36]) is almost understated. Certainly far from overblown. There is a distinctly subdued confidence, rather than anything triumphant, which makes the point that the 'right stance' will always be rewarded - a position that must surely have pleased the Hamburg establishment's strong Lutheran spirit. If anything, the singers tend to underplay the triumph almost to the point of treating it as a matter of course. Though they never render it either mundane or matter of fact. One almost expects just a little more 'pep'. The soloists are also somewhat restrained. Kai Wessel (Daniel) and Laurie Reviol (Arbaces) stand out, nevertheless, as totally in command of roles which they perform tidily and in contained ways. La Stagione Frankfurt plays something of a supporting role - equally careful and precise; the trumpets have a particularly important place in underpinning the military flavour of the action. The CD comes with a useful booklet in English and French as well as German. The acoustic is a little lacking in reverberation and atmosphere. Only if you have come to expect somewhat more lively and interpretation-rich performances of Telemann's vocal music will you find this restraint anything other than appropriate, given the expectations placed upon the composer by his pious patrons. As it is, be assured that Schneider's is an appropriate way to perform this intriguing oratorio. His interpretation deserves close attention. The performers explore the motives, fears and joy of their characters as characters and not as 'types'. If we're truly prepared to enjoy such an unknown work, this is just right. Look into this if you like the less well-lit corners of Baroque choral music; or if you respond to persuasive and contained singing and playing by specialists in music of the period.